My daughter-in-law was at one time obsessed with Dunkin’ Donuts, and her almost-six-year-old daughter, my granddaughter Princess M, loves their strawberry-glazed donuts. With sprinkles. She first eats the sprinkles and then licks off all the icing. The actual donut part is completely superfluous to Princess M’s enjoyment of the treat. 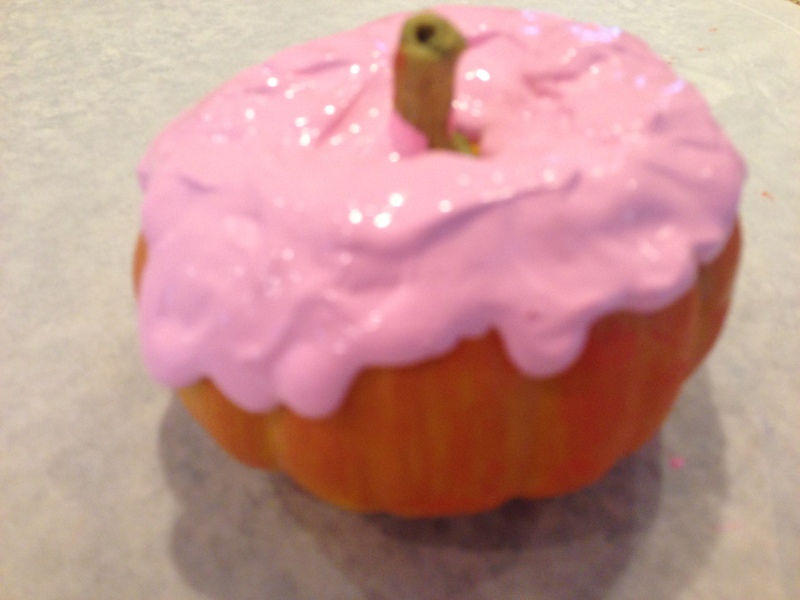 When I saw a picture of a small craft pumpkin DIY-ed into a strawberry doughnut at http://thediyplaybook.com/2015/09/diy-donut-pumpkin.html, I knew I had to give it a try as a gift to the Princess for her birthday next week. I thought this would be a piece of cake to make (pardon the very bad pun). I bought a small orange ceramic pumpkin from Hobby Lobby for less than $4, and I thought I’d be able to find the rest of the supplies in my home craft stash and in Dan the Man’s pastry stuff. My first order of business was to remove the very large price sticker off the very small pumpkin. (One of my pet peeves is stickers that leave residue on a craft item; does that drive you crazy too?). Of course the sticker made a mess of the pumpkin, and I was unable to get all the residue off by scraping. I tried using nail polish remover to remove the remaining stickiness. This technique was successful, but it also removed a good amount of orange paint. This leads me to Crapsmanship Rule #2: Whenever possible, cover up the mistake. 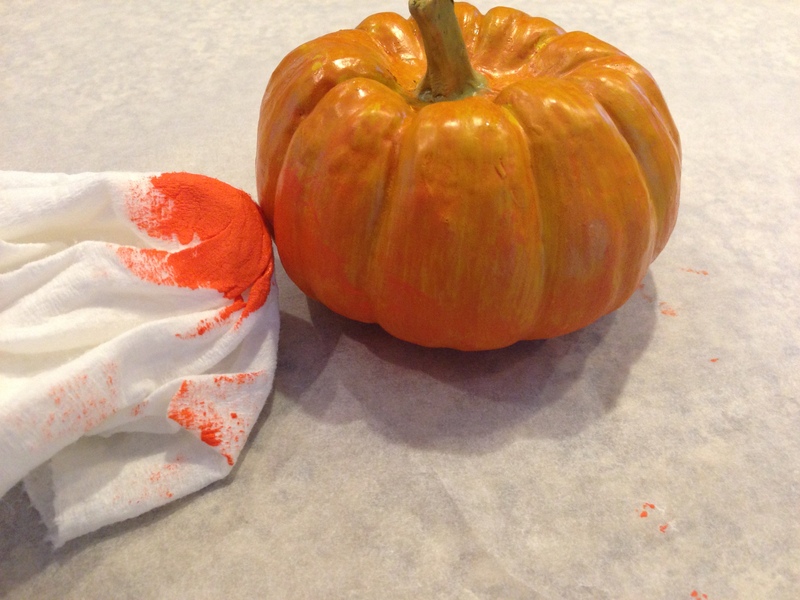 I used orange craft paint and a wadded up paper towel to dab orange back onto the pumpkin. This bit of crapsmanship worked just fine. On to the faux strawberry icing. I again raided my drawer of craft paint for a bottle of pink. 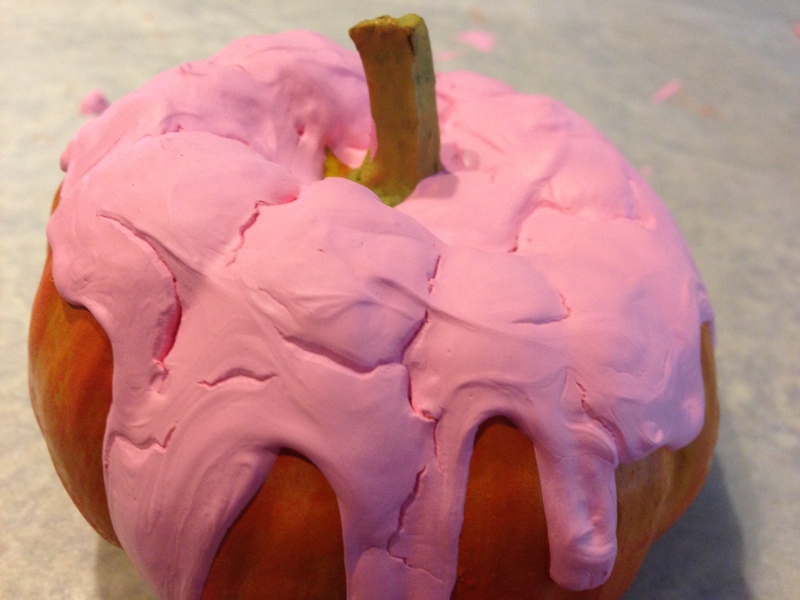 I poured the paint onto the top of the pumpkin and tried to make the paint drip down the side. This didn’t work as planned, so I added more paint to make it all drippier. 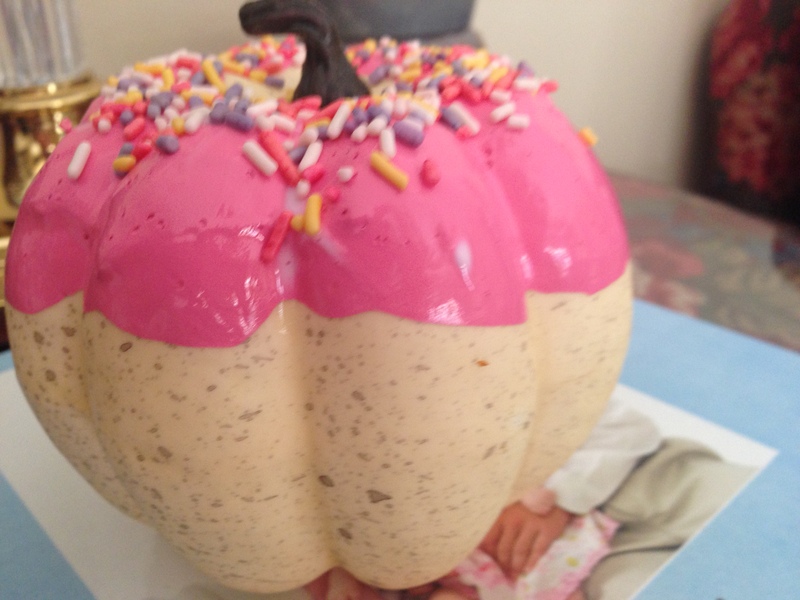 Because the paint was unwilling to cooperate on its own, I used a paintbrush to push paint down the side of the pumpkin. 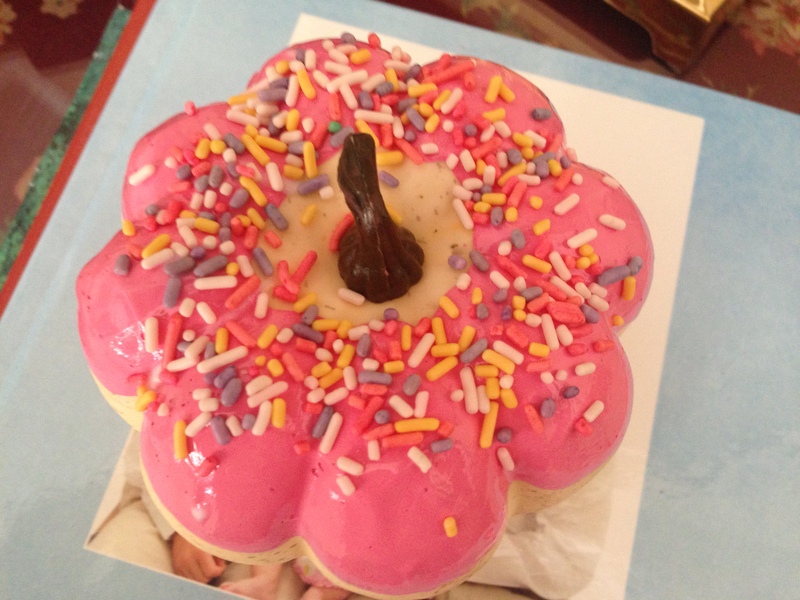 This made little peaks form in the ‘icing,’ and it definitely didn’t look like anything Dunkin’ Donuts would serve. 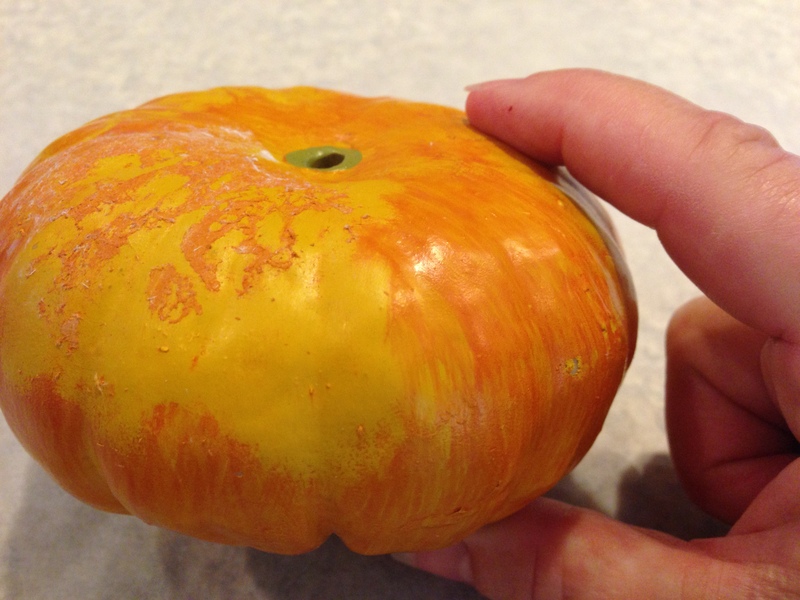 Frustrated, I decided to let the pumpkin set overnight to see if the paint would level itself out as it dried. The next morning, not only did the peaks remain, the paint had cracks and crevices in it, probably because I had laid the paint on so thickly. So I had to institute Crapsmanship Rule #3: Throw the damn thing away! No amount of crapsmanship was going to redeem this project, so into the trash can it went. I didn’t give up, though, because I knew Princess M would enjoy the gift. I got another pumpkin (a white one this time) and a better grade of gloss paint. (I used Martha Stewart multi-surface high gloss paint.) This time, I poured the paint into a bowl and dipped the top of the donut into it. This technique worked perfectly, undoubtedly because it mimicks what real donut makers do to glaze their goods. The paint dried beautifully — in part due to the higher-quality paint and in part because the paint went on thinner. The next day, I painted ModPodge onto the painted section to act as glue and shook a container of cake sprinkles over the top. Cute, cute. Once this dried, I painted more ModPodge over the top of the sprinkles to help them adhere (and to keep Princess M from being tempted to eat them!). Happy birthday, Meghan!